In next 4-5 years Rs 21,000 crore will be invested in setting up or upgrading cold storages to address the problem of stockpiling of perishable commodities. There has been an urgent need to upgrade existing cold storage plant and machinery, and technology. An under-developed food processing value chain is another issue that needs to be resolved. Currently 68 per cent of the existing cold storage capacity is used for storing potato and yet farmers are not getting the right price. The situation in other commodities no better. Crisil Research has estimated that investment of Rs 16,000-21,000 crore is being lined up in the sector between 2019 and 2023 for optimising the domestic post-harvest value chain and to feed the downstream food processing industry. According to Crisil Research director Hetal Gandhi, fresh investment was expected from private players, while the government typically supported the sector through subsidies. For instance, the union ministry of food processing offered subsidy at 50 per cent of the project cost with a cap of Rs 10 crore. To set up a multi-commodity cold storage of 10,000 tonnes capacity, investment of around Rs 20 crore is needed with a payback period of 6-7 years. Undoubtedly, cold storage forms the most vital post-harvest horticultural value chain for the downstream food processing industry. 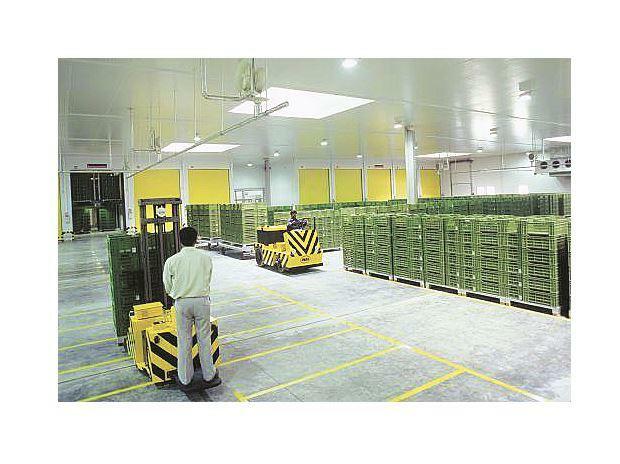 The current cold storage capacity in India is pegged at 37-39 million tonnes (MT). According to official statistics, there are about 7,645 cold storages in the country with 68 per cent of the capacity being used for potato, while 30 per cent is multi-commodity cold storage. Top potato producers of Uttar Pradesh and West Bengal make up 55-60 per cent of the overall domestic cold storage capacity. Crisil also expects the cold storage industry to grow at a CAGR of 13-15% over fiscals 2019-23, mainly driven by rising demand for processed food, fresh fruits & vegetables, seafood and bio-pharmaceuticals in exports markets. Considering that potato produce in the current 2018-19 season alone is estimated at more than 52 MT, the sub-optimum capacity of cold storages only gets magnified. Another highly perishable horticultural commodity tomato is estimated to touch almost 20 MT in production this season, thus further dwarfing the cold storage capacity. Currently, 95% of the cold storages are owned by the private sector, 3% by cooperatives and the remaining 2% by the public sector undertakings. Since, bulk of the capacity is owned by the private sector, there is greater need for the central and state governments to rise up to the occasion and support the beleaguered industry. UP has nearly 2,000 cold storages with combined capacity of nearly 15 MT, followed by Madhya Pradesh, Maharashtra, Haryana etc. The rising agricultural production, including horticultural crops, over the past several years has not only put added strain on the governments to keep the prices remunerative for farmers even during glut but also keep a balance over retail inflation. According to experts, the long term solution for higher farm income and farmers’ prosperity is the growth of a viable food processing industry being fed by a robust network of cold storages and transport infrastructure to keep the farm produce remunerative, keep moderate retail food inflation and maintaining the food security of the nation. “Majority of the cold storages in UP are either sick or on the verge of getting sick owing to the lack of capital to upgrade and subdued outlook, since the staple crop of potato which we stock has itself been facing uncertain and fluctuating market situations over the past several years. Unless, potato value chain is fortified with food processing, there is not much hope for our survival,” Agra-based Rajesh Goyal, who is also the acting president of the Federation of Cold Storage Associations of India lamented.